Felimazole There are 2 products. Felimazole Tablets for Cats reduces the amount of thyroid hormone produced by the thyroid gland. 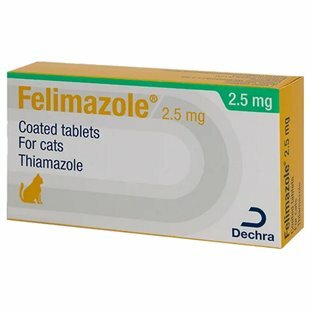 Felimazole tablets are given to cats to control hyperthyroidism in cats. Hyperthyroidism is a common condition in older cats and is due to overproduction of thyroid hormones from the thyroid glands. A pair of these glands are present in either side of the neck and are usually very small. Symptoms of hyperthyroidism include increased size of the thyroid glands, weight loss, an increased appetite, intreased thirst and urination, hyperactivity and occasionally gastrointestinal symptoms such as vomiting or diarrhoea. Occasionally, cats with hyperthyroidism may develop heart, kidney or eye disease. Felimazole tablets are safe and effective in the treatment of hyperthyroidism in cats and can only be prescribed by a Vet. In hyperthyroidism, one or both glands become very much enlarged, often becoming easy to feel. Felimazole tablets contain the drug thiamazole which suppresses the amount of thyroid hormones released. Felimazole is indicated for both the stabilisation of feline hyperthyroidism prior to surgical thyroidectomy and for the long-term treatment of feline hyperthyroidism. The purpose of the drug is to control excessive production of thyroid hormones. Felimazole tablets are given by mouth. Methimazole, the active ingredient, is very bitter. Felimazole comes as a coated tablet for ease of administration. Do not break or crush the tablet. Always follow the dosage instructions provided by your Vet. If you have difficulty giving the medication, contact your Vet for advice. Wash hands with soap and water after giving the medication. Blood levels of thyroid hormone will be checked by your Vet at regular intervals, and the dose of Felimazole increased or decreased as needed. The lowest effective dose should be used.